Unlike April 2013 when I had five weddings and a Civic Ball, this April has been exceptionally quiet on the bookings front. The Dunston Hall evening wedding showcase took place on the 2nd and I’m pleased to say resulted in another booking for a wedding at the venue next year. Good to meet up again with some of the other recommended suppliers at Dunston – Kelly from Eventiss cakes (excellent chocolate cake as usual), Matt Brasnett of ‘I do’ photgraphy and Brian Russell of Norwich Artistes, The following Sunday (7th) some of us set up our stands at the beautifully refurbished Ivy House Hotel at Oulton Broad. This show was once again organised by the excellent EDP team and was very well attended. The Ivy House really is a lovely venue and I will be adding it to my recommended venues blog. I spent an evening with Laura & Daniel and Louise & Leon going over details of their weddings which are coming up in May at the Brook Hotel and Elms Barn respectively. It was another lovely day for EDP wedding show at Dunston Hall. Once again it was very busy most of the day and I’m pleased to say that as well as lots of interested couples, Charlotte and Stuart booked me for their wedding at Brasteds next year. A call came out out of the blue from Mustard TV and as a result I was interviewed in full Town Crier livery for their tea-time show on Friday 25th. Unfortunately the link is no longer available but apparently I was very good! I even made up a rhyme for them which was broadcast as part of the interview. Mustard TV, it is pretty hot! Don’t forget that if you would like your company advertised to the fine citizens of Norwich, give me call or drop me an email. My rates are very reasonable. See you next month. This entry was posted in Diary on May 7, 2014 by Bob Lloyd. 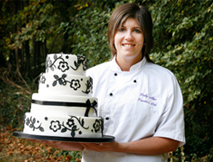 March started out with a wedding show at The Birches in Bircham Newton. One of my first weddings was at this venue a few years ago and for those who live in the north west of the county it is certainly worth a look. I followed this up with a visit to Norfolk Mead in Coltishall. They are building a new function suite that should completed by late Spring and I am pleased to be their recommended toastmaster. 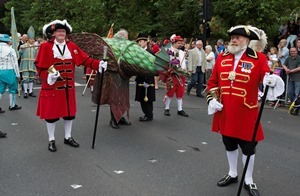 Then it was on with the town crier livery to support the Norfolk Hospice ‘Hold-Up’. This is the third year running I have supported this event and this year, with the help of the community police, they succeeded in arresting business people across the county. They are held in ‘prison’ (actually the Masonic rooms on St Giles) until they have paid their bale money – a minimum of £500. 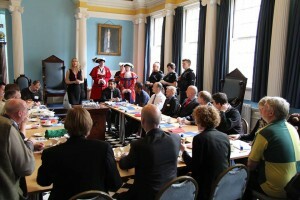 It’s not that bad really as they are given lunch and get and get a visit from the Lord Mayor. This year the charity raised in excess of £11,000. I was joined this year by Cromer town crier Jason Bell and North Walsham town crier Roger Hopkinson. 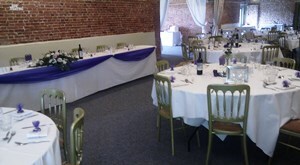 A beautiful sunny day at Cley Mill for their wedding fair was next. This really is a unique venue in Norfolk and looks a treat with newly refurbished sails. 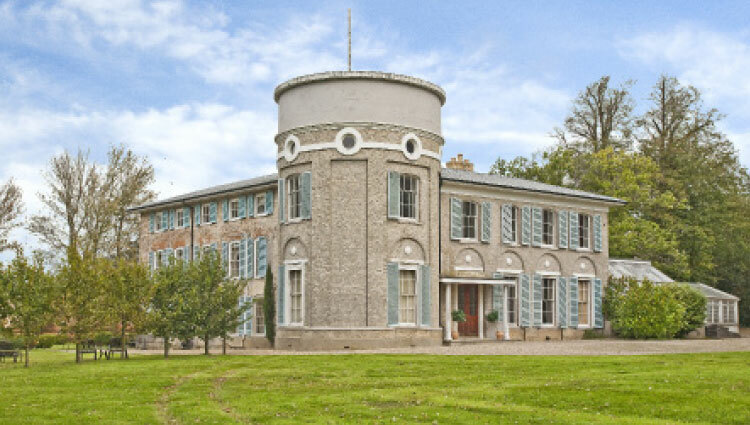 There is now the option of erecting a marquee in the garden area thus increasing their capacity to hold up to 80 guests for a wedding or function. There were a good number of interested visitors, but it was also good to catch up Luke of LA Leisure marquees, Lisa of ‘chair covers and more‘ and Graham of J’s cars. 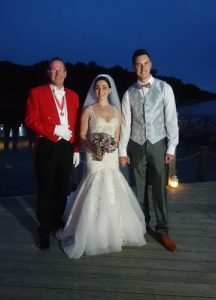 Simon and Sarah did a great job of managing the day and once again I am pleased to be associated with such a splendid venue as their recommended toastmaster. For some stunning photographs of Cley Mil and some other ‘North Norfolk gems’ do take a look at Chris Taylor’s blog. On Thursday 20th I had an interesting tour around the Norfolk Club on Upper King Street Norwich. This was organised by Chris & Sarah Greenfield of ‘Best of Norwich‘. It’s a fascinating building with loads of history. Have a look at their website. 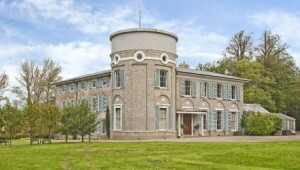 On Saturday 22nd I visited Ormesby Manor. This is another wonderful building that is full of character. It is going to make a stunning venue for weddings in the future. Watch this space. 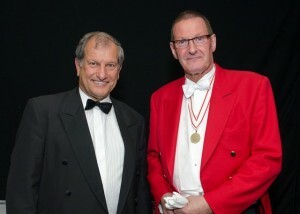 In the evening I was in my ‘reds’ as MC for the Compassion UK Charity Ball at the Mercure Hotel in Norwich. This event has become a regular in my diary and this year nearly £1200 was raised to support the charity. 174 guests enjoyed a lovely meal, had fun with heads & tails, won prizes on the raffle and then danced the night away to the top class Lee Vasey Big Band. Next years date is in the diary for 21st March when the event will be raising funds for the East Anglian Air Ambulance. I’m going to be busy the rest of this month delivering flowers for Margaret Emms florist. It’s Mothers Day on the 30th so it’s going to be a busy week. This entry was posted in Diary on March 25, 2014 by Bob Lloyd. 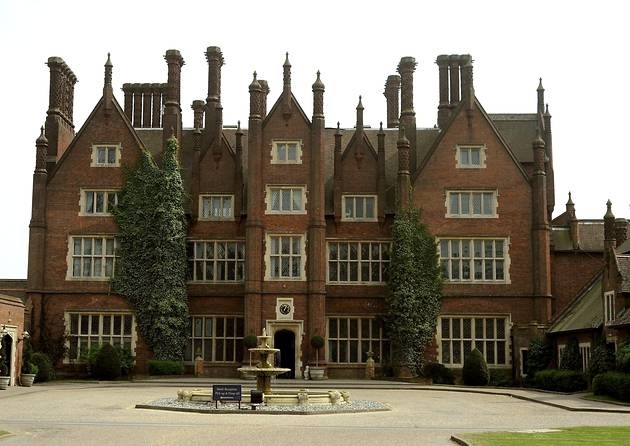 On 2nd April there is an opportunity to view Dunston Hall and meet some of their recommended wedding suppliers at their wedding showcase evening. 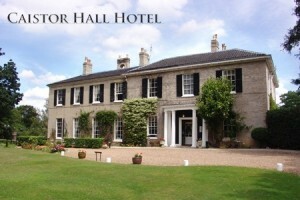 A welcome drink and canapes will be served and the wedding team will be there to show you round and discuss your plans. I will be there along with wedding cake, flowers, dresses, photography and entertainment exhibitors. It starts at 6pm and finishes at 9pm. Please let Dunston Hall know if you plan to come. This entry was posted in Diary on March 14, 2014 by Bob Lloyd. February is fairly quiet but so far I have had attended two wonderful wedding shows with another to come towards the end of the month. 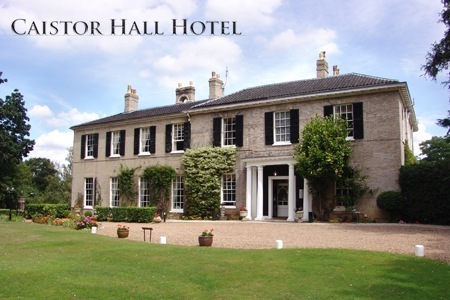 On the 2nd I welcomed hundreds of visitors to the ‘The Wedding Prom & Party Show’ at Sprowston Manor. This was a great show with many new exhibitors. I was particularly pleased as a couple made the journey especially to come and book me for their wedding next year. There will be a repeat performance on 14th September so put the date in your diary now. 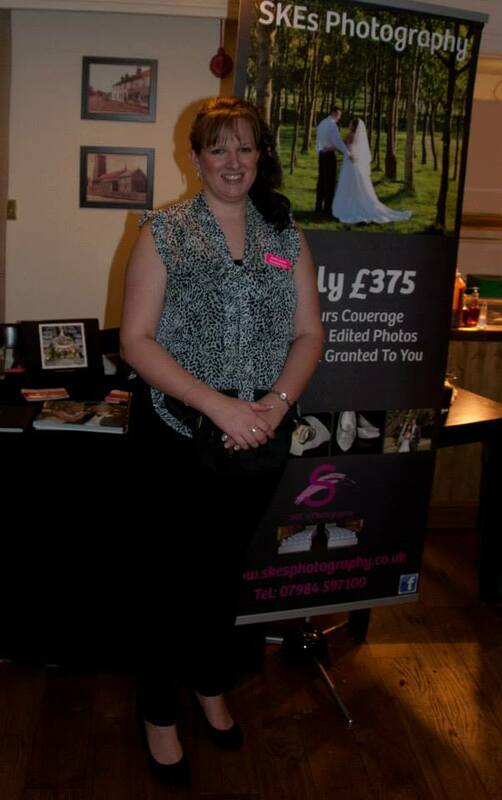 On Saturday 8th I again welcomed visitors to the Wedding Party Show at Elm Farm Country House. This was a different type of wedding show being held in the evening instead of the usual all day Sunday affair. The hotel provided fish & chips @ £2 and live music was provided all evening by singer Laura White & guitarist Paul Hill, harpist Xenia Horne, Synergy mobile disco and The Dulcet Tones. 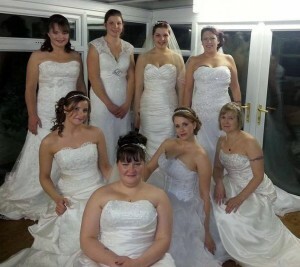 A wedding dress fashion show was staged by Norwich Bridal Studio with hair by Kirsty and make-up by Kelly and then a free raffle rounded off a really successful event. It was good to see familiar faces exhibiting and meet some new ones. Well done to Sophie who also runs SKE’s photography, for all her hard work. 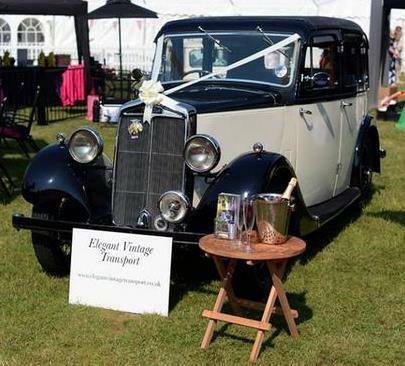 The largest wedding show in the county at the Norfolk Showground was held on Saturday and Sunday 22nd & 23rd. It is organised by the EDP and was a great success. It was a complete day out with professionally choreographed fashion shows, over 150 exhibitors, restaurant and much much more. Once again it was good to meet up and network with some old friends and to make many new ones. I’m pleased to say that I took three booking over the weekend and had four more confirmed by the following Tuesday. On the 28th I carried out my duties as Deputy Town Crier to the City of Norwich at the making of Freemen of Norwich ceremony Click the link to watch video report by Mustard TV and no I am not falling asleep although I must confess in one or two shots it does look like it. Disappointed that the video doesn’t show any of my proclamations but Heh ho it’s not about me. This is a grand occasion when eligible citizens are awarded the honour of becoming freemen of the city. 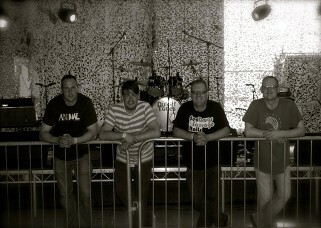 A few bookings in March so have a look at the events page and watch out for next month’s post. This entry was posted in Diary on February 12, 2014 by Bob Lloyd. It’s been a fairly quiet start to 2014 which, after the madness of the run up to Christmas, is not a totally bad thing! 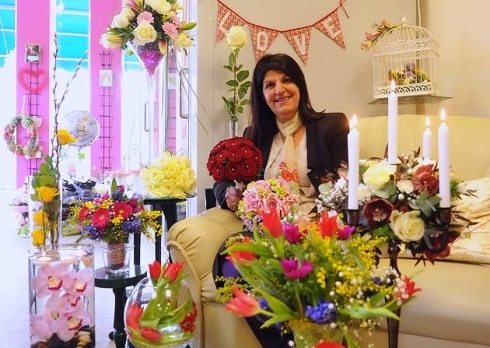 It was good to meet up with the BNI Kett Chapter again at the Brook Hotel on the 2nd when I subbed for Mary Murray of Margaret Emms florists (below). Mary also provided the table displays for the Gardline Dinner mentioned below. 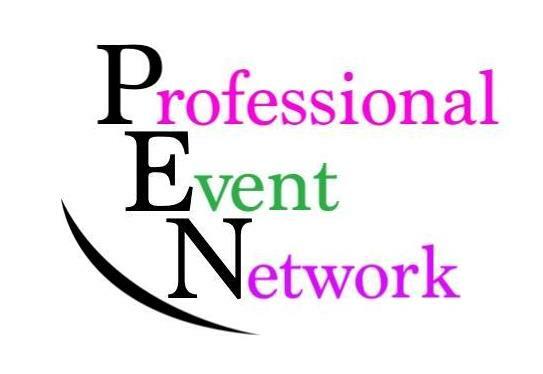 I met old and new friends at the PEN (Professional Event Network) at Roundwood on the 9th. This was a social gathering and I look forward to the next get together in March. 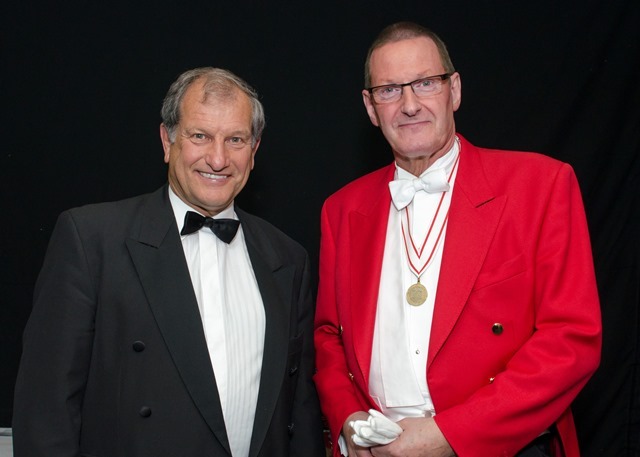 On Saturday 11th I had the pleasure of acting as toastmaster for the Camping & Caravan Club District Association Dinner at Park Farm Hethersett. I had been booked by Ros and Michael Lawler whose daughter’s wedding I had been toastmaster for back in 2012. We all enjoyed an excellent meal and service from the Park Farm team. The following day (Sunday 12th) was an early start to set up at the first wedding show of the season at St. Andrew’s Hall in Norwich. It was well attended and I had quite a few couples who were interested in my services. 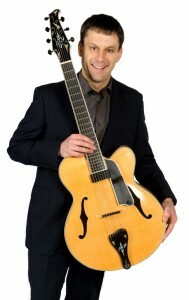 It was good to see brilliant guitarist Paul Hill again. He has teamed up with singer Laura White and they make a great team to entertain guests at any function. and the excellent Lee Vasey Big Band (pictured). 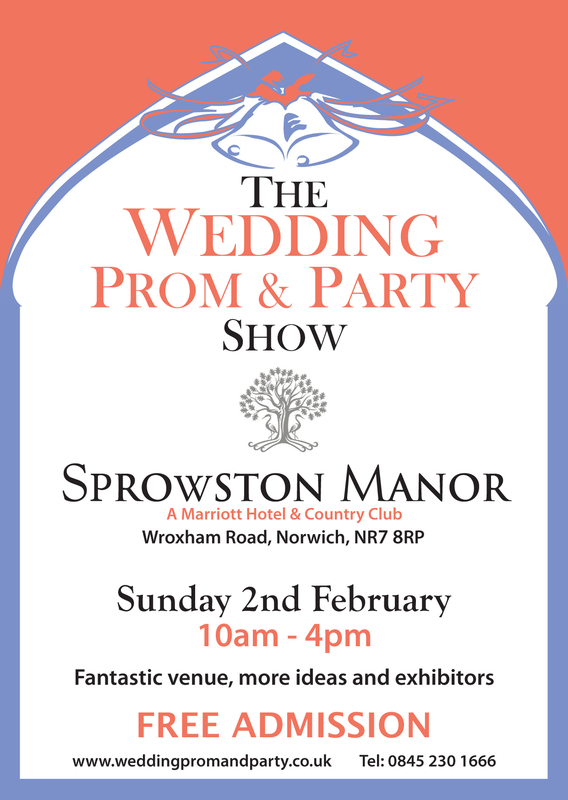 February will be starting off with my welcoming visitors to the Wedding Prom and Party Show at Sprowston Manor on Sunday 2nd. 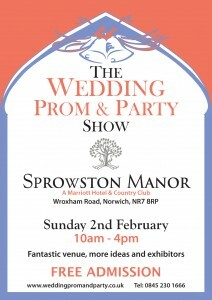 This is one of the biggest wedding shows in Norwich and well worth a visit for couples planning there wedding. Perhaps I will see you there. This entry was posted in Diary on January 26, 2014 by Bob Lloyd. July started with my annual appearance at the Lord Mayor’s Street Parade in my role as Deputy City Crier alongside City Crier David Bullock. We both lead the parade and take turns to proclaim along the way. Once again the weather kept fine and there was a good turn out to take part in the festivities. Next up was another booking that is becoming an annual feature. I assist in welcoming and announcing proceedings at ‘Lunch on the Green’. This event is jointly organised and hosted by ‘Best of Norwich’ and Clapham & Collinge on All Saints Green. Money is raised for a local charity. Then it was time for a couple of marquee weddings. Jemma & Adam’s was held at Peartree Cottage, Wymondham and Lucy & Chris were at the Old Queens Head, Tharston. Both were wonderful occasions with excellent food and entertainment. Among those who contributed to the celebrations were photographer Jamie Groom together with musicians Skyliner, Xenia Horne and Scratch the Cat. Excellent food was provided by Classic Choice Catering. Jemma & Adam’s afternoon tea was courtesy of M & S.
September was fairly busy with three weddings, a charity evening, two town crying bookings and six wedding shows! 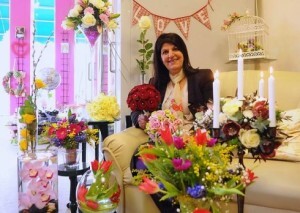 I had also started a part-time day job delivering flowers for a local florist and managed to fit in some evening shifts as banqueting host at the Holiday Inn Norwich North. My beautiful weddings were with Joe & Aimee in the grandeur of St Giles House Hotel; Emma & Chris in the character filled Brome Grange Tithe Barn and finally with Alan & Debbie, back where I started the wedding season in April at Dunston Hall. This time we were in the intimate Snug Bar and Wentworth Suite. The lovely Terri Brice did the photographic honours here while old friend Lee Blanchflower took the pictures at St Giles House with Joe & Aimee. Alan & Debbie went for the self-managed Funky Diva Disco. The charity evening at Brome Grange was a night to remember with celebrities Bob Champion and Ron ‘chopper’ Harris in attendance. Funds were raised for the President’s Sporting Club Charity which provides equipment for disabled children. It was good to work with celebrity photographer Lisa North, top magician Sean Goodman, and comedian Mickey Pugh who hosted the auction. 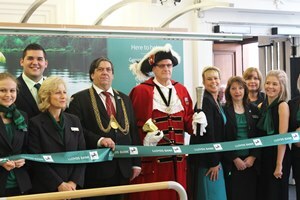 My two town crying bookings involved the re-opening of Specsavers in Great Yarmouth and the re-branding of Lloyds bank (no longer Lloyds TSB) at the Surrey Street brank in Norwich. I have copied my two cries below. Don’t forget, if you would like to raise the profile of our company on the streets of Norwich in the same way, get in touch with me. I also took time in September to visit the new wedding venue at Ormesby Broad. ‘The Boathouse’ is still in the process of being built but is on schedule for opening in early 2014. I already have two bookings for this stunning picturesque venue and am looking forward to seeing it when completed. Thankfully, October was a very quiet month with no bookings, although I still had flowers to deliver and some evenings at the Holiday Inn. 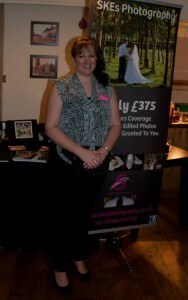 There was also of course the big EDP wedding show at Dunston Hall and Dunston’s own showcase evening. Attendance at the wedding guide show at the Holiday Inn was hit by the bad weather warnings but we still made some good contacts. 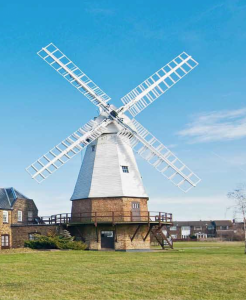 I took a last minute booking in November to town cry on behalf of the Multiple Sclerosis Therapy Centre Norfolk. They needed votes to try and win a grant as part of ITV Anglia’s ‘People’s Millions’. I like to think my efforts contributed to them winning the phone in votes and receiving the grant of over £30,000. 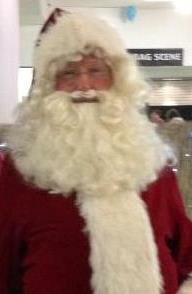 I also started my shifts as Santa in the Castle Mall grotto and these continued into December. My last booking of the year was at the Zest Rooms @ Potters Leisure, Hopton on Sea. I welcomed guests and made announcements at their New Year’s Eve Ball and then, after a quick costume change into my town crier livery, I rang in the New Year at midnight. Well that’s it for 2013. If you enjoyed it half as much as I did, then I enjoyed it twice as much as you! Happy New Year everyone. This entry was posted in Diary on January 1, 2014 by Bob Lloyd. 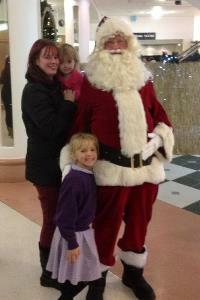 I have had great fun being Santa again this year at the grotto in Castle Mall. Because of other commitments I wasn’t able to do as many shifts this year. However, I still had lots of ‘screamers’ – those who were to scared to meet Santa; plenty of the right age who believe and give Santa a big hug; and the little babies who don’t really know what is happening but are happy to sit with Santa and get their little fingers entangled in his beard. Highlight of course was a visit from my granddaughter who hadn’t a clue I was granddad bless her. This entry was posted in Diary on December 20, 2013 by Bob Lloyd. The 7th & 8th was a busy weekend. On Friday I donned my Town Crier livery to assist in the opening ceremony of ‘Celebrate Norwich & Norfolk’. This is a weekend dedicated to raising the profile of many different expressions of Christian faith across the region. There were seminars, choirs and dramatic acts to entertain the crowds, plus exhibition stands ranging from the Mother’s Union to the Christian Motorcycle Association. During the day on Saturday I introduced the entertainment and interviewed some of the exhibitors so that the crowd could learn a little more about their projects. 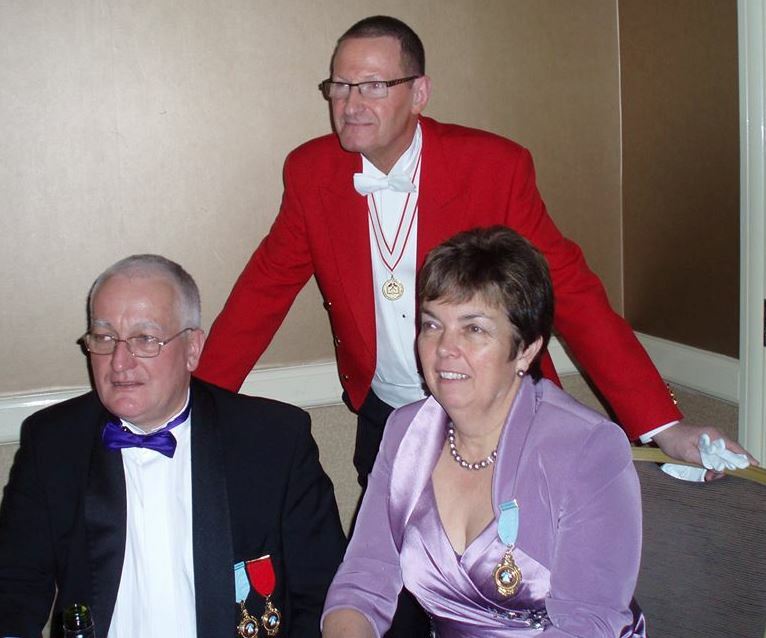 At 4pm I shot off to the Cambridge Belfry Hotel to be toastmaster for the Charles Edward Keyser Lodge Ladies Festival. The previous year they had booked me for the same occasion at Dunston Hall, and I was very pleased to receive a follow up booking. Although quite relaxed occasions the role of the toastmaster includes the announcement of the many toasts made during the evening. These include the ‘toast to the ladies’, reputedly the first recorded toast. Gifts are given to all the ladies present and the evening ends with dancing to the early hours. I had a little break in the middle of the month but then it all started to happen again on the 28th with Cliff & Yvonne’s wedding at Caistor Hall. 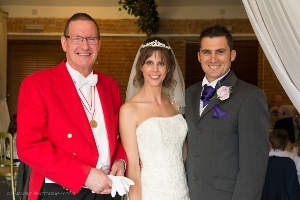 This was another case of a repeat booking as I had been toastmaster for Yvonne’s son Matt and his wife Emma back in 2011. On that occasion Cliff had been best man but today it was Matt who had the honour of giving his mum away so it was good to see everyone again. 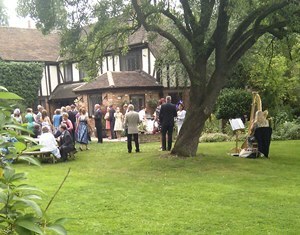 Following the wedding ceremony we moved to the Garden Room for drinks and canapés. We enjoyed Xenia Horne playing the harp and a caricaturist moved quietly among guests creating pictures that in some cases caused great amusement. Even though this was a smaller scale wedding I was pleased they appreciated my presence to coordinate the day and hopefully make the day a little more special for all involved. To end the meal, cheese & biscuits accompanied by port were served and I then introduced the speeches before taking my leave. This was a special wedding due to the fact that both Yvonne and Cliff had come from previous marriages. They have now found happiness together and are so obviously in love with each other. Photographs were taken by John Parfitt who I have worked with many times. John has now handed over the reigns of his company to Sarah Kingston who has been with him since 2008. However, John will still assist Sarah but be focusing more on his car hire business, Elegant Vintage Transport. The next day a full programme was planned for Sarah & Leon’s wedding celebrations at Dunston Hall. 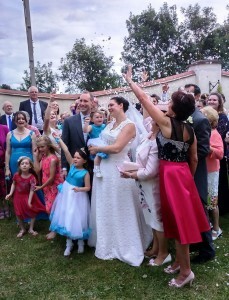 I greeted guests as they arrived from the church and assisted photographer Sam Markwell. 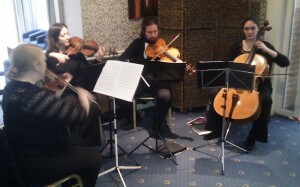 We were entertained by the Vivace String Quartet before I called the guests to dinner. None of them were expecting what happened during the meal. Basil Fawlty impersonator Ed Wells was on hand to create mayhem accompanied of course by Manuel. I have worked with Ed at a number of functions and he is great fun. He really gets the guests involved as well by ‘training’ Manuel’s and Polly’s. Visit his website to see what he gets up to. When it came to the evening, opera singer Kirsty Anderson, who had also sung at their ceremony in the church, led the happy couple in their first dance. There was a candy cart, fun casino and DJ Dave Starbuck to keep the evening guests entertained. So ended another great wedding with a smashing couple. I had to dash off after the first dance and drive a few miles down the road to the Swan Inn at Long Stratton. A few weeks earlier I had been contacted by Paul Ayres in the USA who had found me on the internet. His long-time friend, Peter Moore, was celebrating his 60th birthday but Paul was unable to make the trip over. He had written a speech for Peter which he asked me to deliver at the party. I kept my ‘reds’ on and it made quite an impression in the crowded pub. His family and friends appreciated the gesture and although I only stayed a short while, it was clear that everyone was enjoying themselves. So ended June, but July brought more weddings and other events, including a new part time job! Watch this space. This entry was posted in Diary on November 17, 2013 by Bob Lloyd. The month of June started with what turned out to be one of my favourite weddings of the year. Jenna & Edward contacted me after having my services recommended to them and then booked me at the St Andrew’s Hall wedding show back in January 2012. They were married at St Michael’s Church, Oulton on the 1st of the month and following the ceremony I was ready to greet them at Fritton House. Once again a bus was used to ferry some of the guests to the venue. I guided everyone down for the drinks reception to the beautiful setting by the lake where we were entertained by the ‘Champagne’ string quartet. Simon Buck took some stunning photographs which you can view by clicking here. Jenna had two bridesmaids, two flower girls and not to be outdone, Edward had two best men! However it was little Max who almost stole the show at one point by jumping in the muddy puddles in his posh suit! Once the guests had taken their seats for the meal we had the speeches. It’s becoming quite a popular option these days to have the speeches before the meal. This is especially helpful for those who are nervous at speaking in public as it means they can really enjoy their meal and a drink without worrying about the speech they have to make. It does mean that guests will probably be very hungry, so canapés following the ceremony are a must in my opinion. Jenna & Edward didn’t have a guest book but invited guests to sign a piece of a jigsaw puzzle and fit it together which was a novel idea I hadn’t seen before – or since. They also had a photo frame to sign which again, is something that is becoming very popular. The signed frame can be displayed easily on the wall rather than the traditional guest book which more often than not gets put away in a draw and almost forgotten. In the evening I introduced the cutting of the cake, Jenna throwing her bouquet to all the single ladies and then their first dance together as husband and wife. It was nice to see that they had spent some time in choreographing their dance to Christina Perri’s ‘A thousand years’. A nice touch which made it more memorable for themselves as well as their guests. About a week before the wedding, Jenna decided that she did want a video of the day after all. I made some suggestions and fortunately ‘Alice Barker Images’ was able to help them out. The result is excellent and I always have the tissues handy to wipe away a tear when I watch it. Click here to have a look. It’s a lovely reminder of a wonderful day with a lovely couple. This entry was posted in Diary on November 1, 2013 by Bob Lloyd. The month of May saw me as toastmaster at four more weddings. The weather wasn’t to clever for my first wedding of the month with Erin & Gordon on the 11th. They arrived at Hoxne Village Hall in a horse and carriage and umbrellas were at the ready. The poor horses and grooms were soaked to the skin. By the way, I say grooms as that is what those who look after the horses are called. Strictly speaking the man who stands by the side of his bride is the ‘bridegroom’ not the ‘groom’. A groom cares for the horses, a bridegroom cares for his bride! Andrew Watts of Woodland Studios was on hand to capture the day and guests danced the night away with their own choice of songs from the Funky Diva juke box. 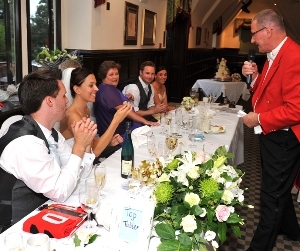 If you are planning a celebration at a venue where there is no venue manager on hand the presence of a toastmaster is even more essential for the smooth running of the day. 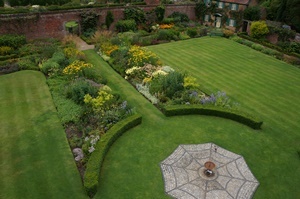 Next was a return trip to Hoveton Hall Gardens, this time with Rebecca & Oliver. This is a beautiful setting for a wedding with many different locations for photographs. Some beautiful shots were taken, by top photographer Tatum Reid, of the new Mr & Mrs Carter along with quite a large wedding group that included four bridesmaids, four flower girls and two best men! I greeted the guests, some of whom arrived from the church in a double decker bus, and guided them down to the Spider Garden where drinks and canapés were served. Then it was up to the marquee for dinner and entertainment by singer/guitarist Tom Pearce. The meal was provided by top chef Kevin Gardner and his team from the King’s Head Coltishall. In the evening there was a photo booth and band ‘Empire‘ to entertain the guests, and the whole day was captured on video by Peter Breame of Dream Capture Video. 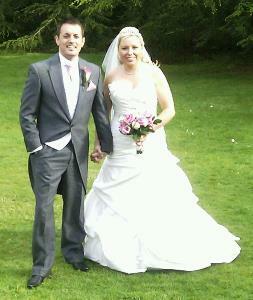 Damain & Nadine had a wonderful wedding day at The Oaklands in Norwich. 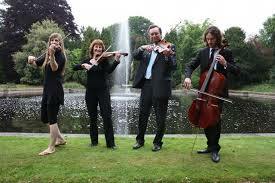 As they arrived from the church, guests were entertained by the Overton String Quartet. Later in the evening DJ/singer Jamie McGuire took over. As usual we enjoyed a lovely meal at the Oaklands and photographs were taken by Sally Lowe. Damian & Nadine are a lovely couple who sent me a lovely letter of thanks and recommendation. “Hi Bob From the moment we arrived at the Oakland’s you were the first person we saw waiting for us. You took control from the beginning and if you hadn’t been part of our day it would not have been as fantastic as it was. All the guests were impressed and commented on toastmaster Bob. You really are fantastic at what you do and we would highly recommend that everyone has you at their wedding. 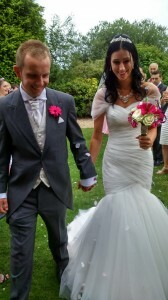 Not only were you professional and organised, but also funny and a real pleasure to have share our day. From the first moment you took away any concerns, nerves and worries we may have had. We were able to relax completely knowing that all the timings and organising was well under control. Whenever I did think of something, I didn’t even need to ask as you had already dealt with it. 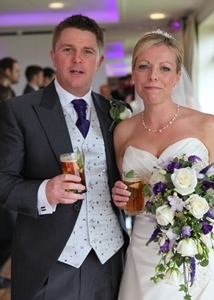 Truly brilliant, thank you so much for making our wedding a dream come true”. 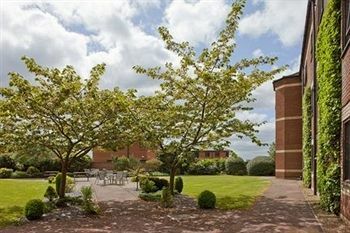 The next day I travelled over to Zest Rooms at Potters Leisure. It was an early start for lovely couple David & Tracie as they were holding their whole wedding there. 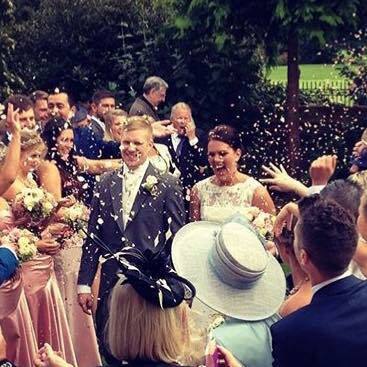 I love announcing the bride into the ceremony – “Ladies & Gentlemen would you please stand. 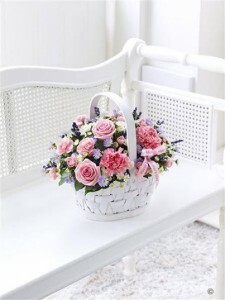 Accompanied by her Father and attended by her bridesmaids, your bride”. Cue music and away she goes down the aisle. Andrew Watts of Woodland Studios was on hand again to capture the day. I am always fed well at Zest and enjoyed an excellent meal. Jill and her team give first class service. In the evening, after cutting the cake, throwing the bouquet and their first dance together as husband and wife, resident DJ Clare got the party started. By the way the cake was fairly unusual in design. 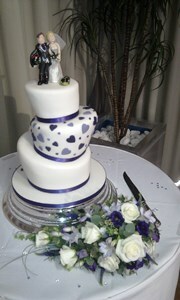 It was made by award winning Anne-Mie of Time4cakes. So ends May. Their are six bookings to report on for the month of June. This entry was posted in Diary and tagged bride, guests, hotpon, hoveton, hoxne, May, oaklands, photographs, toastmaster, video, zest on October 20, 2013 by Bob Lloyd.